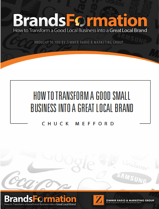 Transform your good local business into a great local brand. BrandsFormation® is a simple, four step proven system that brands businesses and helps local businesses like yours. In their corner, the big guys have teams of marketing professionals along with large budgets for research and advertising. Finally, the small business owner has someone in their corner, Chuck Mefford and the Zimmer Radio and Marketing Group. In the Brandsformation seminar, Chuck shares real branding success stories as well his system that any good business can implement, and brand their business just like the big guys. We'll work with you to tell your business's story in a way that will resonate with your customers so that you can connect with them on a deeper level. You’ll love what BrandsFormation® can do to accelerate the growth of your company. We facilitate Brand Marketing Workshops (aka: Brandsformation Workshop or BMW) for business owners who are qualified and approved by Zimmer in the Mid-Missouri market to help them determine the best marketing plan and creative needed to achieve results. Sign up for a BMW! Get the First Chapter of Brandsformation! Download now for free using the form below. The first chapter of BrandsFormation helps to get your feet wet in the first steps of branding your business on the radio. We at Zimmer have used the BrandsFormation process for years and have proven success by using it with our clients. You will learn how to create a strategy, a strategy based message, how to be consistent, and how to dominate frequency. Fill out the form below to get your free copy of the chapter of this book and get ready to be excited for taking your business to that next level.